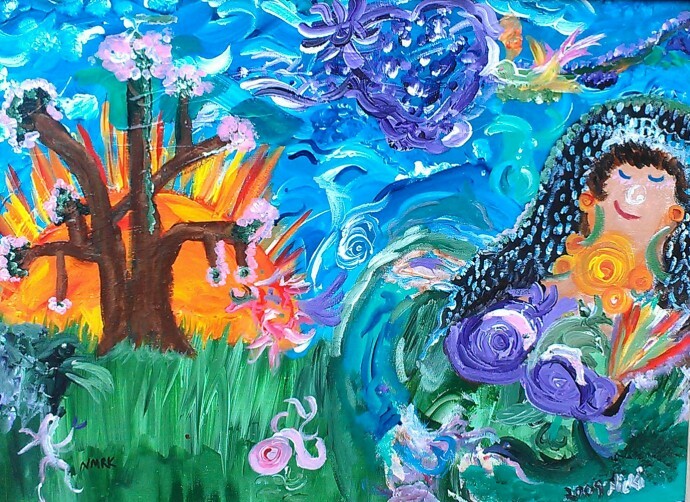 Earth Goddess – Nicki La Rosa ~An Abstract Artist with a Gratitude Agenda. Welcome and THANK YOU! Nicki La Rosa ~An Abstract Artist with a Gratitude Agenda. Welcome and THANK YOU! A Free Thinking, Tree-Thanking, Buddhist Artist. Let's do This! Earth Goddess is one of the only pieces I’ve ever painted with the intent to portray a specific figure. Completed in 2009 for the “Spring into Summer” exhibition at Gallery 800 in North Hollywood. It is one of my favorite pieces, with much going on for the viewer to play with. She is content in her own creation, and even the tree bends to play with its friends below. I hope you enjoy Earth Goddess! Thank you! PAINTING PARTIES ~ We Come to You! “Anywalls”- Good for brain and heart! Fine Art America is an online store for reproductions (not signed or serialized). You can purchase prints on metal, canvas, photos, phone cases and even shower curtains with Nicki's art on them. Additionally, those looking to use Nicki's works in print, web or t.v. ads can do so through Fine Art America.